Welcome to Abruzzo, the land of Arrosticini. Writing the article for the #FoodIS section is very demanding. At the beginning of this food tour among the Italian regions, I couldn’t image how difficult it could be to find the right version of a recipe and its origin. It happened also when I wrote this article. No specific moment when the recipe was born. No specific place where it was made for the first time. Here the information I collected about the history of arrosticini (and of Abruzzo). If you would like to feel like a real ‘abruzzese‘, there is nothing best than cooking Arrosticini above all during summer. It is one of the most famous Italian street food and in the latest years you can eat them in the surrounding regions too, like in the southern part of Le Marche and in the eastern part of Lazio. Outside Abruzzo it is easy to find an industrial product that is not handmade. Which is the difference? Well, those industrial are perfectly cut and prepared with the fattest meat while the handmade ones alternate pieces of low-fat meat with pieces of fat and are different in dimension. Arrosticini are only made of lamb or mutton meat and no other type of meat, such as pork, is considered. The strong bond between the shepherds and the land comes out from every single aspect in Abruzzo. The transhumance, that is the movement of the cow and sheep flocks from the plains to the mountains and viceversa, marks the seasons and the activities that men and women usually do. September is the month when shepherds leave again towards the plain to find mild climate and non-frozen fields for their flocks. Once the women remained at home, reaped the grain, harvested the fields, prepared the preserves. In May the shepherds came back to home high in the mountains, where the grass is more green than in any other places. Nowadays the procedures are changed, but the times are the same as in the past. May and September are important months for the transhumance, even if today flocks are moved by vans. The old paths where the flocks moved up and down are called ‘tratturi‘ and today they have become an off the beaten path to walk discovering amazing preserved places. More than 3,000 kilometers of roads including the Tratturo Magno, 244 kilometers from the Basilica in Collemaggio to the plains of northern Puglia, covered with shepherds eating cheese and drinking red wine. Why I told you the story of the transhumance? Because the origin of arrosticini is strictly connected with this activity. Probably you don’t know that in this region there is the Gran Sasso, a massif of about 3,000 meters high, where the main activity is sheep farming. When shepherds were far away from their homes the only food in abundance was sheep meat. They ate older sheeps to save the meat of the dead animals. Otherwise when they sold the meat they saved the remained meat close to the bones. The meat was pierced with little logs founded along rivers. In the half of 19th century there was the first public document regarding the purchase of the Arrosticini in Civitella, but the very hometown of Arrosticini is Villa Celiera (750 inhabitants! ), recognized as the main place where to taste high-quality Arrosticini. However there is no specific place, but a specific area because the transhumance involve a territory. They were born at the beginning of the 1900s (or probably before) at the foot of the Gran Sasso mountain on the eastern side. Arrosticini started to become popular in the ’50s when they were served in the local trattorie. During the Fascism Arrosticini were already recognized as typical of Abruzzo. This dish is quite a symbol of the mountains in Abruzzo and for this reason was declared as “typical product” of the region. Well, you have probably seen in the picture what I am talking about. Arrosticini are 20 cm long skewers with 1-1,5 cm high meat cubes. The cubes are from 4 to 5. The name in the regional dialect is ‘rustelle‘ or ‘arrustelle‘ because the object used to cook Arrosticini is called ‘rustellara‘. This is something between a grill and a brazier and is narrow and long. 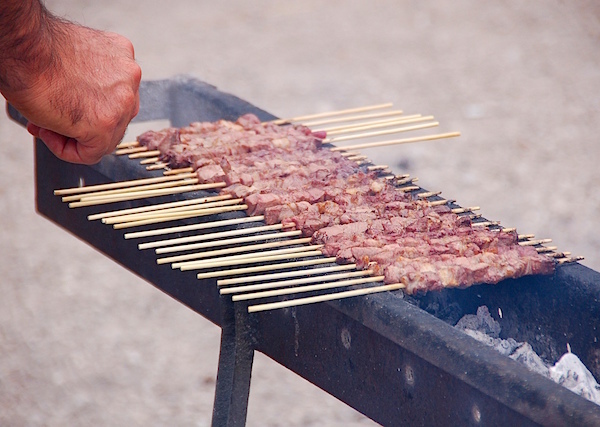 The real Arrosticini are prepared with sheep meat. The best type of sheep that can be used is called Ciavarra, that is a young sheep who has never been pregnant. The industrial Arrosticini are made of mutton. 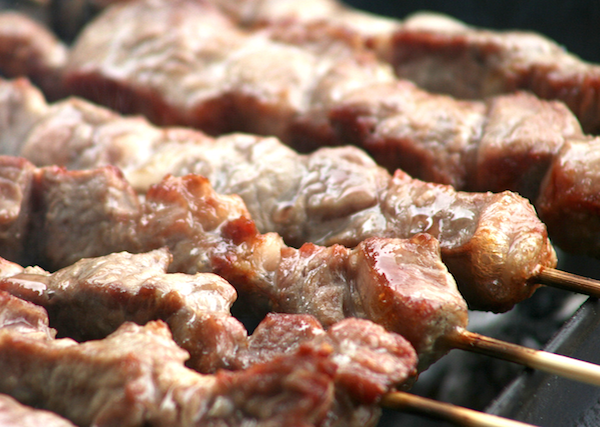 The procedural guideline says that high-quality Arrosticini are exclusively made of ovine meat. The sheeps have to be born and breeded in companies located in Abruzzo and slaughtered in the same area within 48 hours after exiting from the breeding farm. How to cook and eat Arrosticini? There is not only a specific way to cook this dish, but also a way to eat them. Normally Arrosticini are eaten with a glass of red wine (Montepulciano d’Abruzzo) and the wine is often mixed with gassosa (typical Italian fizzy drink similar to soda). If you would like to feel like a real local, eat Arrosticini together with a slice of toasted bread dressed with a bit of olive oil. Usually Arrosticini are not dressed but at most they can be seasoned with rosemary and/or chilli pepper. 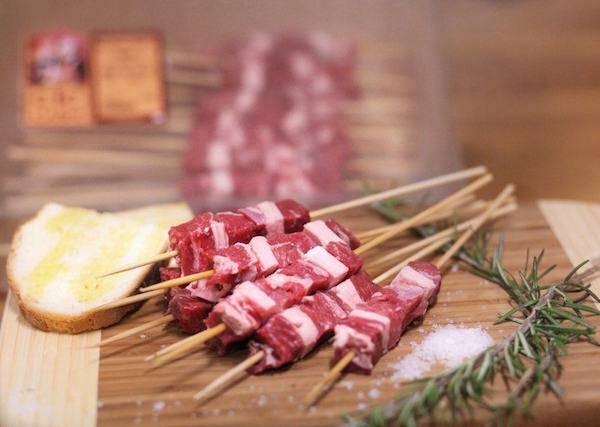 The presence of the fat meat cubes (25% of the total meat) is necessary to make the Arrosticino soft and not dried. That’s why is cooked on a brazier and not in the oven. They need to be eaten when they are still warm. For that reason they are wrapped up with tinfoil or put in a special terracotta container. The special brazier used to cook Arrosticini is perfect because the wood skewer doesn’t get burnt. The meat is not dressed. Some people say to salt it after putting the Arrosticini onto the rustelliera. Some others say to salt them when they are completely cooked. There are many different procedures to cook them and every family has its own secret. I found a video about how to cook Arrosticini and how to eat them. Let’s see it! You could prepare Arrosticini on your own or… take the chance to plan a holiday in Abruzzo. In the meanwhile subscribe to our #FoodIS newsletter and download the original recipe.